According to Mike Downey and Ryan Stewart, Colin Moock's Essential ActionScript 3.0 is the bestselling O'Reilly book and number four (or five now?) on Amazon's best seller list. I had previously posted about my problems finding a copy of the book, including the major delays by Amazon.com. Apparently others are having the same issues (see the comments at the bottom of Mike's post), which I am sure is a result of unexpected popularity on Amazon's part. Either way, if you are still wondering why you can't find a copy of the book -- now you know! 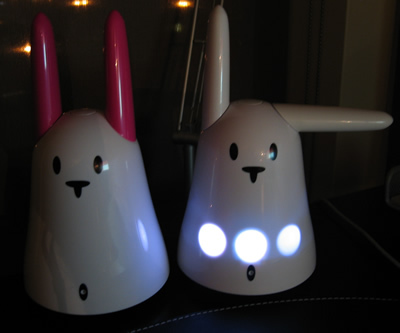 Tonight the UPS delivery man dropped off two Nabaztagtag wifi-enabled smart rabbits and an extra set of ears! Ever since I read Aral's post on his, I have been waiting for my order to arrive. If you haven't heard of these amazing devices, I highly suggest you check out their website to see all the cool features this little device can handle. Basically, the Nabaztagtag can play internet radio, send and receive messages to other 'tags, complete voice activated commands, tell you the weather, act as your alarm clock, and a whole world of other internet-enabled services. I've only had a few hours to play with my new rabbit, but I have to say, this thing is at one of the highest levels of usability I have seen in awhile. The developers (Violet, out of France) went to great lengths to make sure the thing just works. Their website is extremely easy to use, and setup was a breeze once I found a small note with a bug fix for those with Apple's Airport wireless routers. 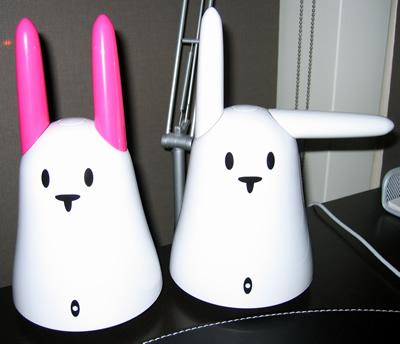 The best use I have found, however, is why I purchased two of the devices: you can "marry" two 'tags and then whenever you move the ears on one device, the ears will move in the exact same position on the second device. So the rabbit in the photos with the pink ears is for my girlfriend who is moving out of town this week. I thought the rabbits might be a cool way to keep in touch over the long distance, and "marrying" and sending messages between the two rabbits will allow for just that. One other quick thing I should note is that there is a very large developer community surrounding these 'tags. There is a public API that is fairly well documented, and developers have made a ton of cool services available including NabAIR, an Adobe AIR application that allows you to control your (or someone else's) 'tag through a simple desktop application.